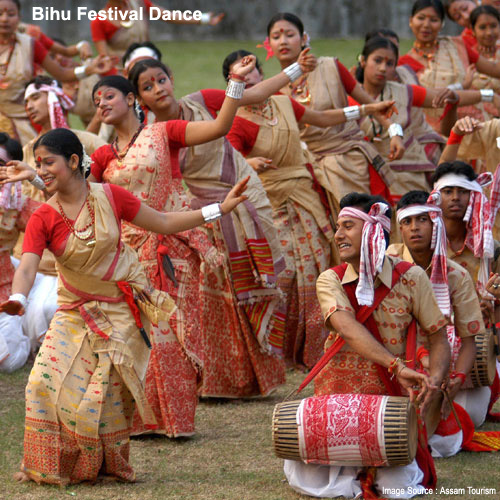 Bihu is the National Festival of Assam, one of the most beautiful states of India, known for its tea gardens, lush green forests and the mighty Brahmaputra. Bohag or Rongali Bihu happens mid April. It marks the first day of the Hindu solar calendar and is also observed in Bengal, Manipur, Nepal, Orissa, Punjab, Kerala and Tamil Nadu with different names. It is a quintessentially harvesting festival of a predominantly farming community. The first day (the last day of the year) is Goru (cow) bihu, next is Manu (man) bihu, this day sees delicacies and fineries galore, next day is Gosai (God) Bihu – dedicated to the resident and temporal deities of the dwelling, farm, livestock – equate it Thanksgiving. Husoris – folk songs, carol style abound during bihu celebrations. The Southwestern monsoon has never missed its date with the vast plains of India for the last thousand years at least. The festivities have evolved over time. The Fat bihu of Lakhimpur area of Assam is one of the earliest surviving types. This is a fertility fest as characterized by the sometimes explicitly worded songs of ‘Mukoli’ bihu and the Jeng bihu – which is performance by and for the women – exclusively. The Bodo people of Kachar hills celebrate Baisago – the rituals being similar to Bihu. There is a feeling of joy around as the farmers prepare the field for the cultivation of paddy. Bohag Bihu is celebrated for 7 days. Assamese cuisines like pitha, larus and Jolpan. On 14th April 2011 it is Goru bihu or Cow bihu, on this day, Cow is bathed and worshipped. On the 2nd Day, 15th April 2011 is manuh bihu or human bihu, on this New Year day all Assamese clean up, wear new clothes to celebrate the new year. Young people gift elders bihuwan, a hachoti, a cheleng etc and seek their blessing. Third day April 16 2011 is Gosai Bihu or Gods bihu. The statues of God are worshiped with devotion in all houses. Modern urban lifestyle has seen ‘Bihutolis’ emerging. Bihu in modern times owes its popularity to its undisputed king Khagen Mahanta. Bihutolis combine traditional songs and dances with comedies and other performance to suit city tastes.